The backdrop to the whole of the Basilica Fields project will be the Great Eastern main and suburban lines out of Liverpool Street at viaduct level, and one of the features will be the multitude of bridges crossing roads both large and small. 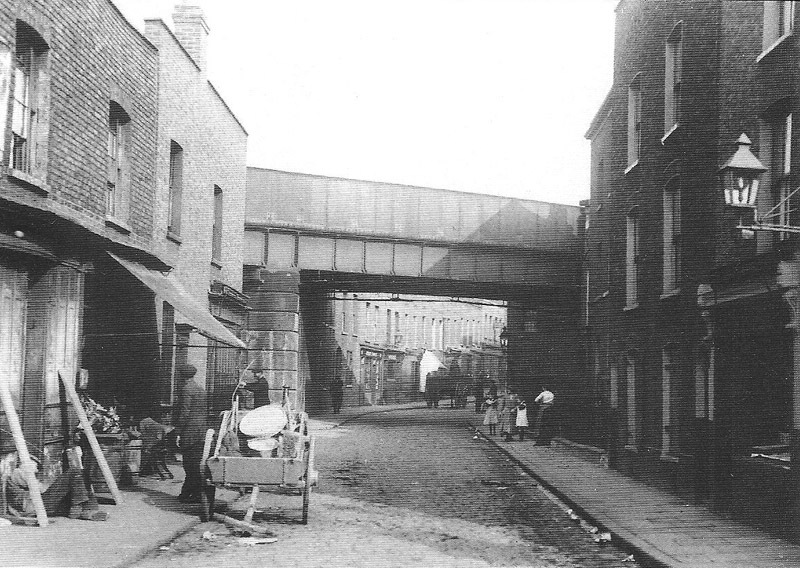 This is girder bridge is not actually on the main line out of Liverpool Street, but is at Limehouse Causeway c1908, and is part of the Great Eastern line to Blackwall, but is a scene so typical of the East End. Limehouse Causeway was part of London’s original Chinatown where all manner of Oriental goods and services could be bought. It’s another photo full of detail – Edwardian litter (no coke cans or chewing gum! ), the dusty street laid with setts, the front room shops with bric-à-brac outside and in the cart, the dirty brickwork, the gorgeous lamp and the sot sleeping it off on the pavement. All this was swept away in the 1930s leaving just the viaduct which now carries the Dockland Light Railway..
How evocative! And what is a “sot”? I am intrigued by the line of the window arches away into the distance, beyond the bridge. Unless there is a change in height of the buildings, or substantial subsidence then the road must be rising quite sharply – how about that for a challenge.. to get such a sweep into the backscene would be very much in the style of Jack Nelson. And that bridge, just calls out for some sharp etchings. And what is hung from the girders? All manner of utilities followed the railway and often hung under the bridges. Some sort of piping or ducting, but perhaps impossible to know for sure. A sot – a habitual drunkard. It’s no doubt Mr Wren sleeping off his three-penn’orth of rum.